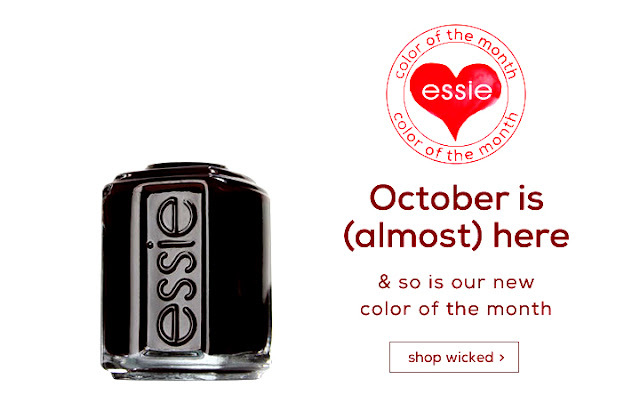 ESSIE NAIL COLOR FOR OCTOBER IS OXBLOOD RED! 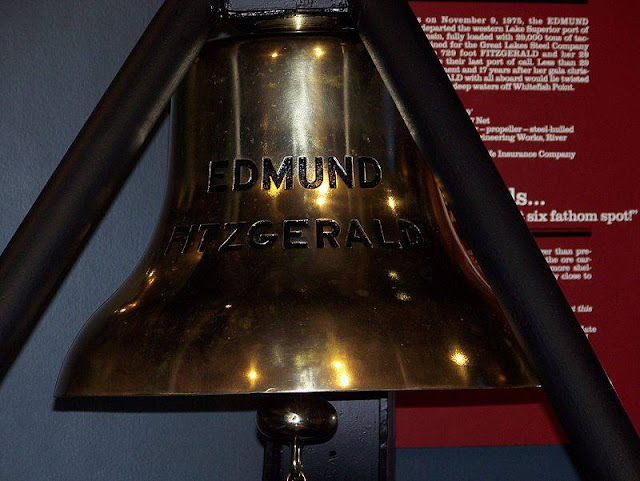 WHY DID THE EDMUND FITZGERALD GO DOWN? 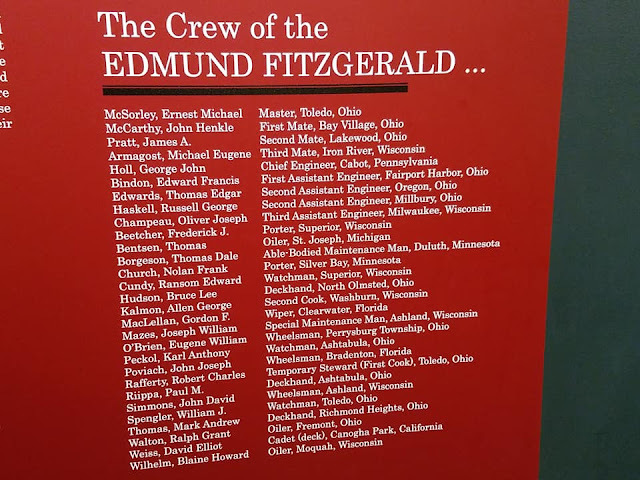 Nobody really knows what caused the Edmund Fitzgerald to sink, but that sure hasn't stopped people from trying to solve the mystery. The recovered bell retrieved from a submersible in 530 feet of water from Lake Superior. May the 29 men who perished rest in peace. 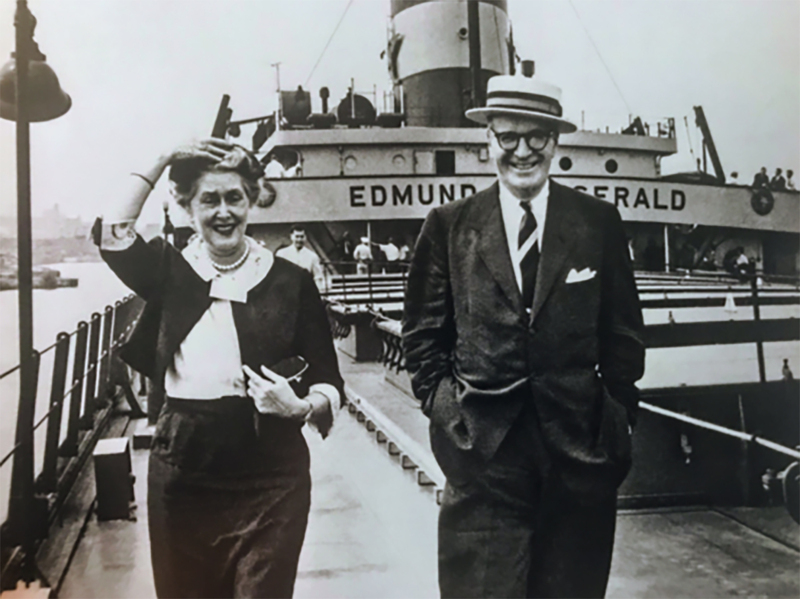 In the 40 years since the ship went down, a cottage industry of shipwreck theorists have tried in vain to solve the sinking of the Fitzgerald, which rests in two pieces in 530 feet of water on the lake bottom 17 miles north of Whitefish Bay. The Coast Guard said the cause of the sinking could not be conclusively determined, it maintained that “the most probable cause of the sinking of the S.S. Edmund Fitzgerald was the loss of buoyancy and stability resulting from massive flooding of the cargo hold. 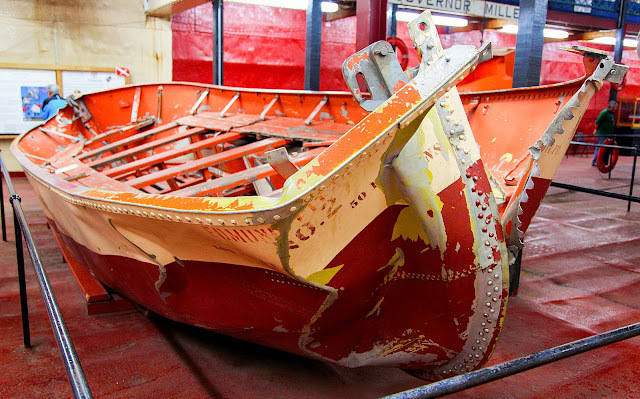 What's obvious is that wind and waves played a big role in the sinking. 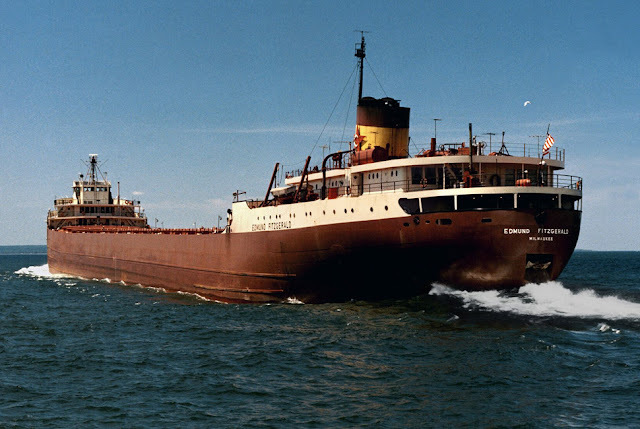 The Ojibwe people call Lake Superior Gichi-Gumi, or “Great Sea.” Given its immense size, the greatest of Great Lakes presents enough fetch on her west-to-east axis to generate waves as large as a four-story building. 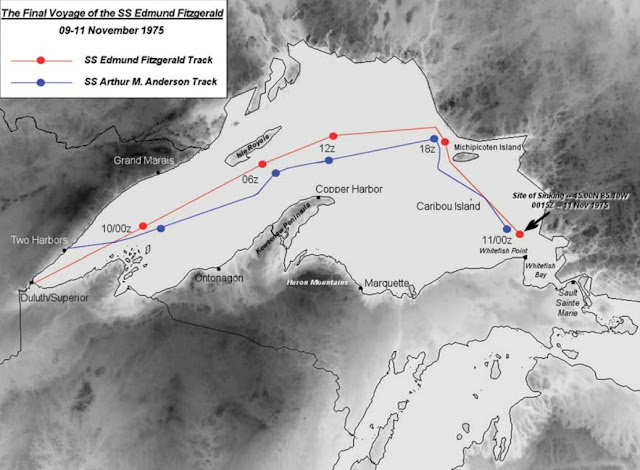 Historically, the “Witch of November,” as lake sailors call the equinoctial roiling of the jet stream, has produced the most violent weather systems on record — the Mataafa storm in November 1905, the “White Hurricane” of November 1913, the Armistice Day blow of 1940, and again in November 1975, a system forever linked with the loss of the giant iron boat Edmund Fitzgerald. Could it be the north wind they'd been feelin'? When the waves turn the minutes to hours? 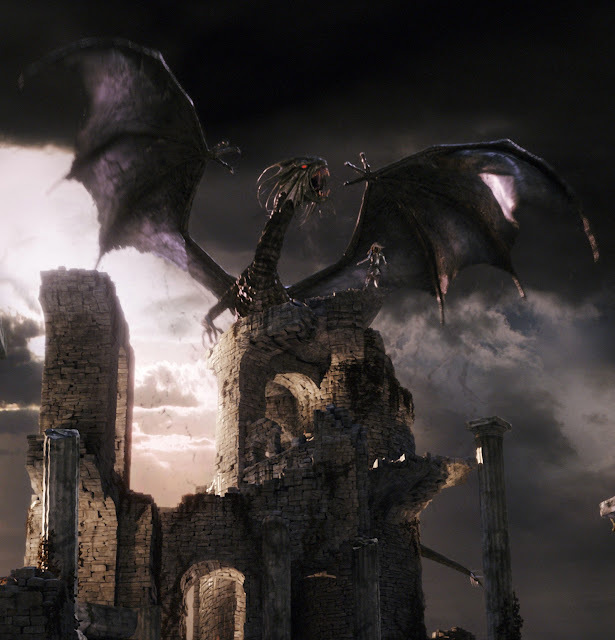 "Jabberwocky" is a nonsense poem written by Lewis Carroll about the killing of a creature named "the Jabberwock". It was included in his 1871 novel Through the Looking-Glass, and What Alice Found There, the sequel to Alice's Adventures in Wonderland. The book tells of Alice's adventures within the back-to-front world of Looking-Glass Land. 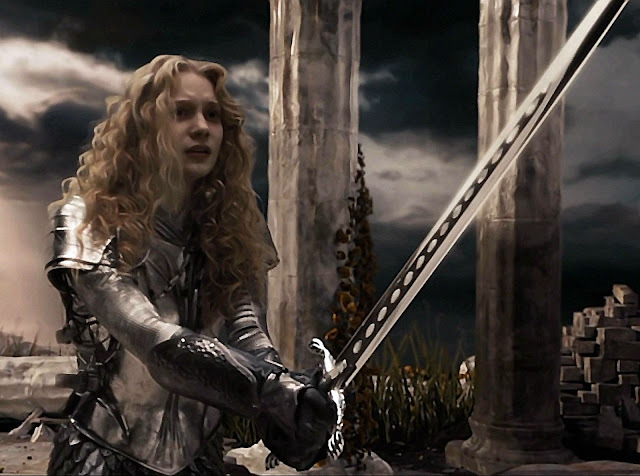 In an early scene in which she first encounters the chess piece characters White King and White Queen, Alice finds a book written in a seemingly unintelligible language. Realizing that she is travelling through an inverted world, she recognises that the verses on the pages are written in mirror-writing. She holds a mirror to one of the poems and reads the reflected verse of "Jabberwocky". She finds the nonsense verse as puzzling as the odd land she has passed into, later revealed as a dreamscape. "Jabberwocky" is considered one of the greatest nonsense poems written in English. 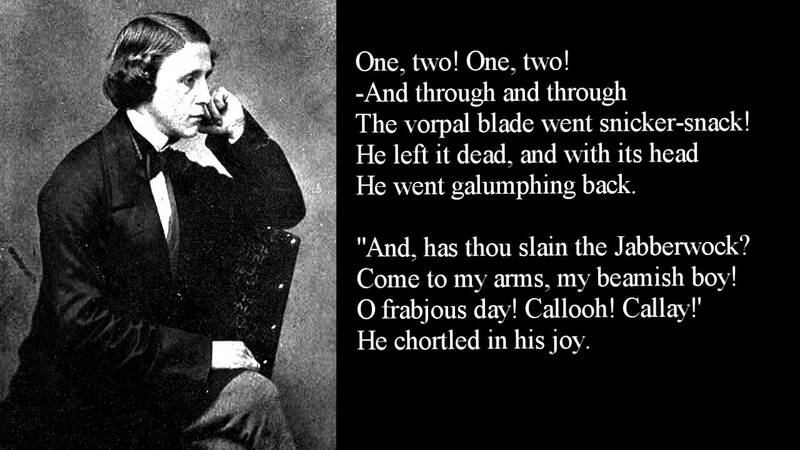 [ Its playful, whimsical language has given English nonsense words and neologisms such as "galumphing" and "chortle". JANN KLOSE NEW LP IN TANDEM RELEASED WORLD WIDE! New album features duet with Renaissance vocal legend Annie Haslam! Award-winning pop singer-songwriter Jann Klose will be releasing the second single titled “Love High” from his latest album “In Tandem” on September 28, 2018! A video of the song is currently being filmed and plans for its premiere in NYC on October 14th at The Cutting Room are currently underway. The song Features top South American musicians: Sakhile Nkosi (AKA) on bass, Ezra Erasmus (Idols SA, John Legend) on keys, Leagan Breda (Lira, Trevor Noah) on drums and Raymond Green (Idols SA) on featured electric guitar. Produced by RJ Benjamin and mixed my Rici Martins (aka SEVVEN) and mastered in Nashville by Ben Kesler. 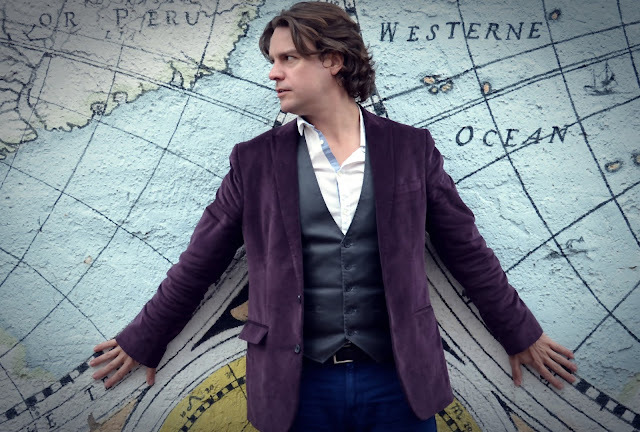 Jann Klose is elated to have his brand-new studio album “In Tandem” released worldwide. Fans can download and stream the album, which features a selection of top South African artists such as Karen Zoid and Tamara Dey, on their favorite digital platform. “In Tandem” also features a duet between Jann and legendary Renaissance vocalist Annie Haslam on a cover version of Peter Gabriel's “Don't Give Up,” which has also been released as a single. The wait is finally over after almost a year's worth of work going into the writing and recording of the album, and Jann is ready for people to hear all the songs on “In Tandem”! “I am so excited to release 'In Tandem' to the world! Jann spent time in SA last year recording his 6th studio album in partnership with the Academy of Sound Engineering, in addition to lending his time and supporting the work of Desmond Tutu's TutuDesk foundation. The album features a selection of SA's finest with RJ Benjamin as producer, songwriting contributions from James Stewart (The Usual), Ziyon (Liquideep), Karen Zoid (who also features on the song she co-wrote), and collab feature from Tamara Dey. 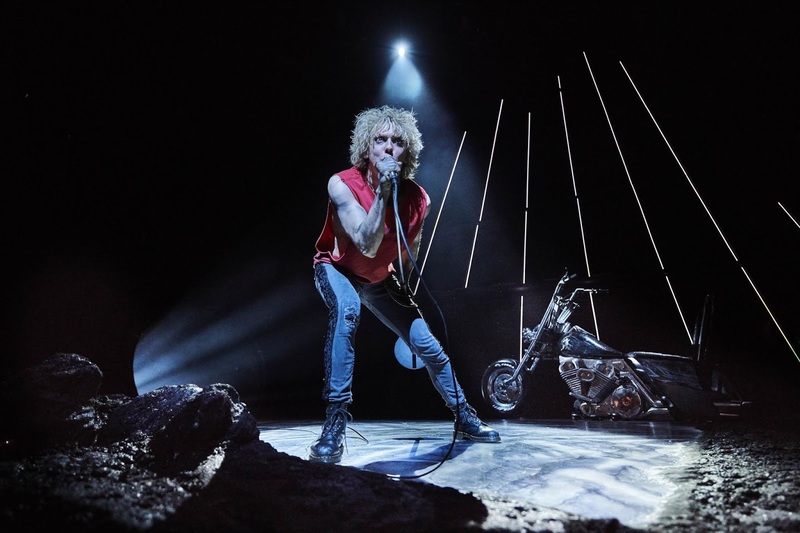 BAT OUT OF HELL! MEAT LOAF MUSICAL COMING TO THE FOX THEATRE! 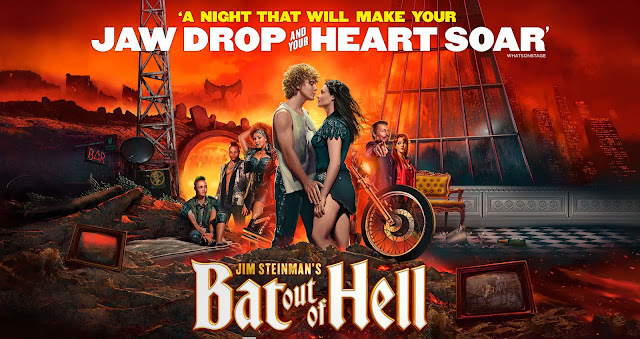 Experience the thrill of London’s most spectacular musical as Bat Out of Hell brings to life the legendary anthems of Jim Steinman and Meat Loaf, in a critically-acclaimed, award-winning production that combines the magic of a musical, with the immense energy of rock 'n' roll. Join Strat, the forever young leader of rebellious gang ‘The Lost’, as he falls in love with Raven, the beautiful daughter of the tyrannical ruler of post-apocalyptic Obsidian. Featuring Meat Loaf’s iconic hits including I’d Do Anything For Love (But I Won’t Do That), It’s All Coming Back To Me Now and Paradise By The Dashboard Light, “this is a musical production like no other." CHICAGO has everything that makes Broadway great: a universal tale of fame, fortune and all that jazz; one show-stopping song after another; and the most astonishing dancing you've ever seen. It’s no surprise that CHICAGO has wowed audiences from Mexico City to Moscow, from Sao Paulo to South Africa. And now it’s coming to your town! Whether you're looking for your first Broadway musical, whether you've seen the Academy Award®-winning film and want to experience the show live on stage or whether you've seen it before and want to recapture the magic, CHICAGO always delivers! The best way to learn anything is to learn from others who’ve been successful at it. Well, while you can also learn a thing or two from the failures of others and those of your own, that’s not the main point here. When it comes to drumming, there is more to it than just hitting the bass pedal and striking the snare drums, hi-hats, and cymbals. Whether you’re taking drumming as a hobby or a profession; technique is the most important thing you need to focus on as a beginner in drumming. But as far as technique is concerned, most of the biggest legends in the world of drumming will almost always emphasize the same things. While each and every professional drummer may have their own favorite types of music, sounds, and playing techniques, here are some 5 drumming tricks that you’ll learn from the legends. The first and most important hack in drumming is to know how to hold the sticks right. For starters, your grip should be solid yet comfortable at the same time. It should be such that you’re not straining too much, neither is it too feeble that the stick could fly out of your hand any minute during play. To hold the stick right, make the shape of a gun with your hand and balance your drumstick on your index fingers’ second crease. Now, place your thumb on top of your drumming stick and wrap the other 3 fingers around it. Start playing with the palm facing down. Repeat the procedure with your other hand and try to perfect this everytime you play the drums. Most of your drumming will be driven and controlled by your wrist. Playing from the wrists allows you to stay relaxed, conserve energy, and make the best use of rebound. While you can play from your shoulders or even your fingers, more often than not, this will only get you to tire faster and make it difficult for you to take charge of volume control. It also becomes easier to improve your speed when playing from the wrist. One of the most popular drumming techniques is the half stroke or the medium-full stroke roll, which is played by hitting your drumhead with the sticks at a 45-degree angle. To ace it when playing the (R L R L) medium-volume single stroke roll, you have to maintain an even stick height to keep your drumming volume consistent. This trick mostly applies when playing double strokes (R, R, L, L). to make the best use of this trick, always play the first stroke with your wrists and the second from the fingers. Again, it will only come out perfect when you’re relaxed as much as possible to keep your strokes even. To become a good drummer, you obviously need lots and lots of practice. The best trick you’ll ever learn from the legends is to always use a great drum set not only during your practice; but obviously also during live performances and studio recording sessions. This way, both you and your audience stand a better chance of enjoying your drumming. Including some that you can view here, there’s a wide range of drum sets on the market ranging from cheap to somewhat costly. You can always start with an affordable kit then work your way up or invest in a quality kit once and for all. Nonetheless, the above are some of the best legend-inspired drumming tricks that both fresh beginners and practicing learners in drumming should keep in mind. The TV special, celebrating 15 years of the musical phenomenon, will also feature performances by Ariana Grande and Pentatonix. 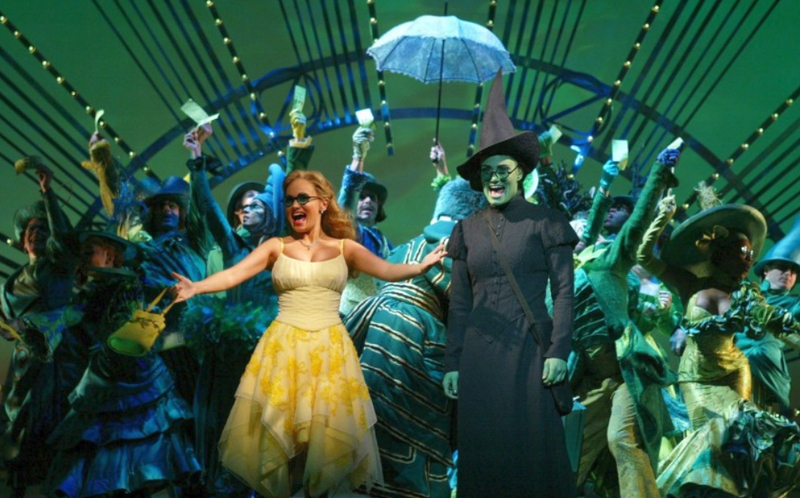 Original Wicked stars Idina Menzel and Kristin Chenoweth will reunite to host and perform during NBC's A Very Wicked Halloween: Celebrating 15 Years on Broadway. The special event will air October 29 (the eve of the musical juggernaut's anniversary) at 10 PM. Performing alongside the pair of Tony winners will be pop star and Broadway alum Ariana Grande (a noted Wicked superfan), the a cappella group Pentatonix, the current Broadway cast of the musical (led by Jessica Vosk and Amanda Jane Cooper), and more to be announced. A Very Wicked Halloween will be taped at the Marquis Theatre with a live audience. Wicked producer Marc Platt will produce the show with Glenn Weiss (who also directs) and Ricky Kirshner of White Cherry Entertainment. DETROIT SPOOK SHOW HALLOWEEN SALE! SOMETHING ROTTEN! NEW SHOW BROADWAY IN DETROIT! RETRO KIMMER HITS 4000 POSTS TONIGHT!! CHINA GLAZE PAINT IT BLACK COLLECTION! ROD STEWART NEW RELEASE! 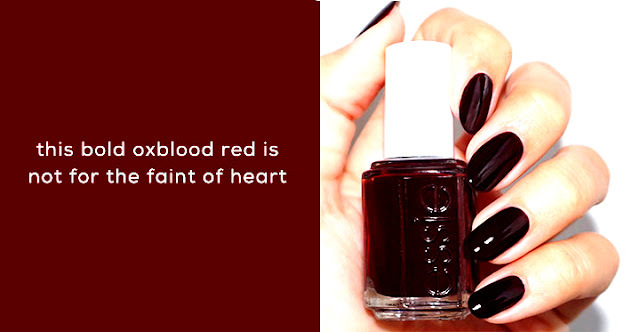 BLOOD RED ROSES!! ELVIS AND PRISCILLA'S HONEYMOON TRAILER IS SOLD! !